Whatever you’re having yourself, like. 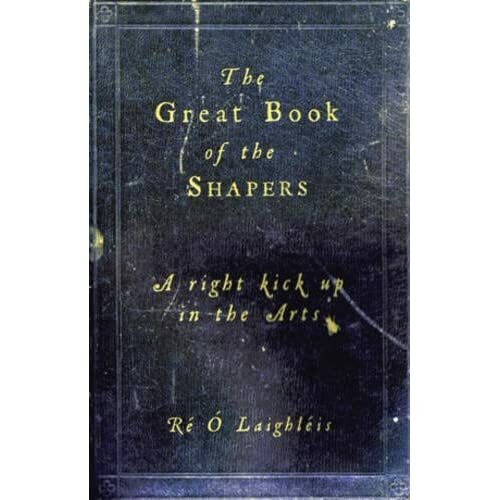 Ré Ó Laighleis, who wrote The Great Book Of The Shapers, has put together an ably-paced book that is a genuine hoot to read. Anyone looking for some sort of roman-a-clef that uses parodies of real people will be disappointed, but at the same time it’s not too easy to recognise the occasional ‘type’ here and there. Think of it as a This Is Spinal Tap of the arts world. That doesn’t mean there aren’t a lot of cute digs at, er, the town known here as ‘Slagway’ – the names of certain pubs, streets, and nearby townlands will definitely remind Galwegians of familiar places, subtly twisted into canny and often filthy inversions: ‘Monodick Street’ anyone? Sometimes the tropes might seem to be trailed out a bit too thinly, as when people start using a hybrid tongue that isn’t quite Irish, but rather resembles Myles na gCopaleen on some pretty strong stuff. But at the same time (spoiler alert), an entire chapter is devoted to the elaborate setup of a pun that is equally excellent and execrable, and it’s brilliantly stretched out, without snapping as it were. You have to take the rough with the smooth with this sort of thing. On occasion you might wish there was a bit more going on, but Ó Laighleis is best at writing books that turn up and make their point well and without too much fuss. Rather than snide satire he goes for riotous and gutsy comedy here, bellylaughs over bellyaching. This is a book you might not want to move in with, though you’d definitely spend the night in a pub with it given the chance.